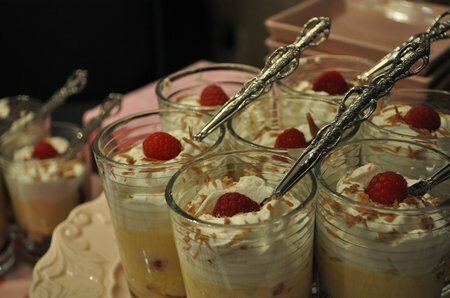 I love these mini trifles. I have served them many, many times and they are always a success. 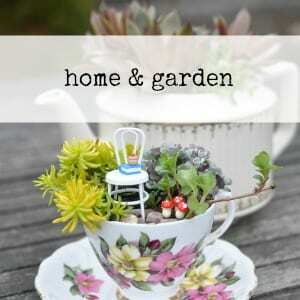 They are great for a tea party too. I’ve tried different variations; there was blueberry for the purple party here, banana for the yellow dessert table here, and I think a mini version of the chocolate trifle I made here, would be great too. For the 100 000 Hits blog party I went with my classic version Raspberry. 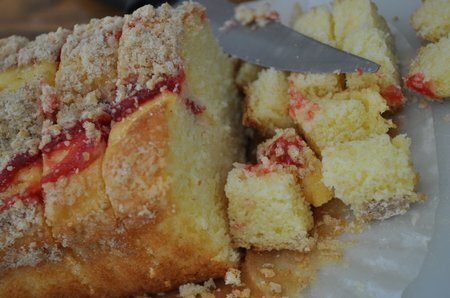 This recipe is more of an assembly kind of a recipe, you could of course make the custard and pound cake from scratch, but this version is quick, easy and really, really yummy. 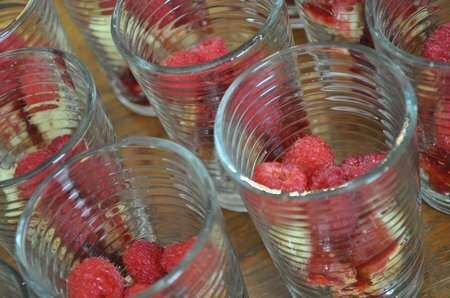 Assemble the mini trifles in a juice glass, or mini parfait. 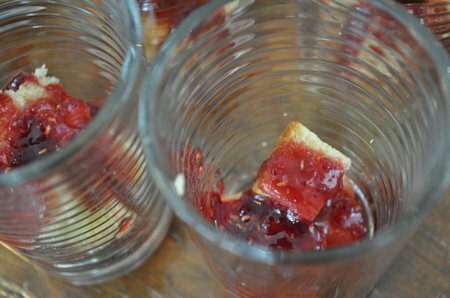 Cut the pound cake into small cubes, and layer into the bottom of the glass. Next take some raspberry jam, and warm it up in the microwave to make it more runny. You can also add a tsp. or so of water to the warm jam. Pour about a tbsp. or 2 over the pound cake. 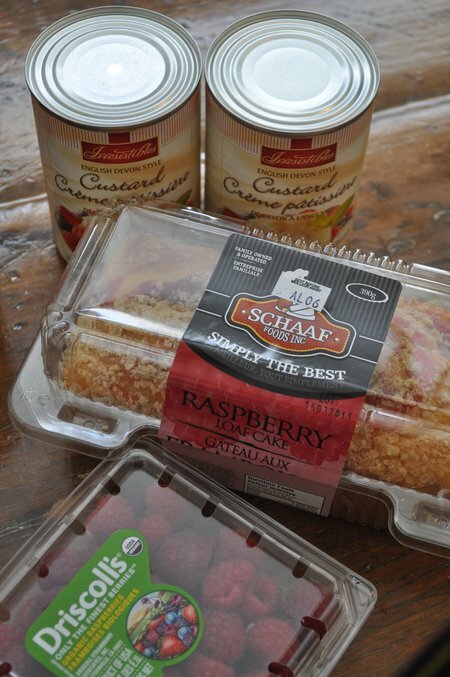 Add some fresh raspberries as the next layer, but remember to save a few for the top. 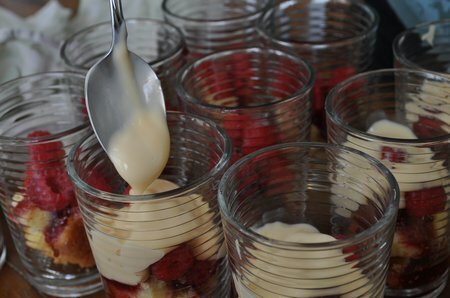 The next layer is the devon custard, just spoon some over the raspberries. If you do make it yourself, let it cool before you add it. Then, whip the cream with some vanilla and sugar, and add as the final layer. 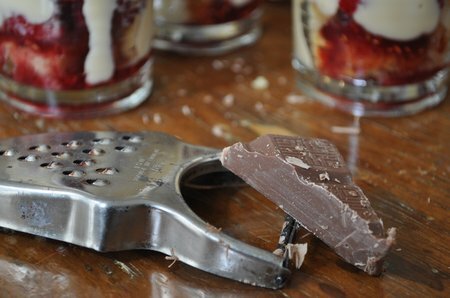 Garnish with another raspberry and a little grated chocolate. I had these sweet silver teaspoons to serve them with. 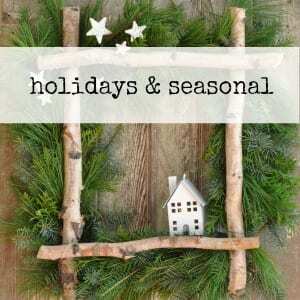 This post is linked up at Whipperberry, Blue Cricket Design, and Paisly Passions. I L-O-V-E this! 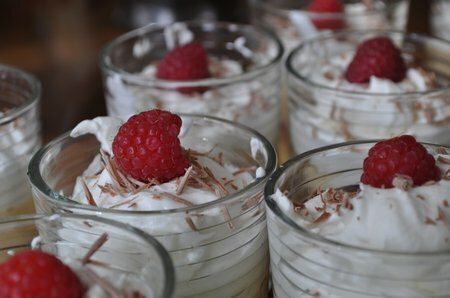 I am hosting Easter and plan on making these mini trifles. This solves the serving issue. 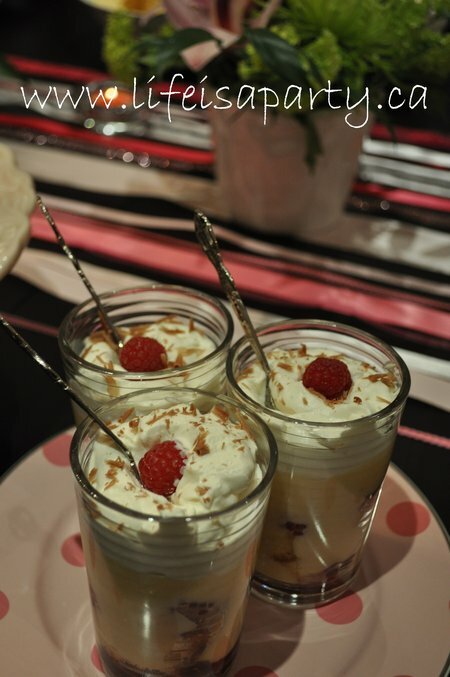 Trifles look so pretty when they are made and then, when you start spooning, they start to lose their appeal. This makes each individual portion gorgeous! 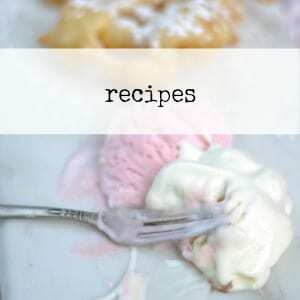 : ) I shared this recipe on my Friday Favorites post today. Feel free to grab a featured button if you would like it. Have a wonderful weekend. These look like a perfect idea for a Christmas dessert spread. 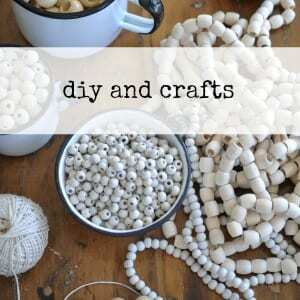 How far beforehand do you think they could be made. The morning of…, the day before…. 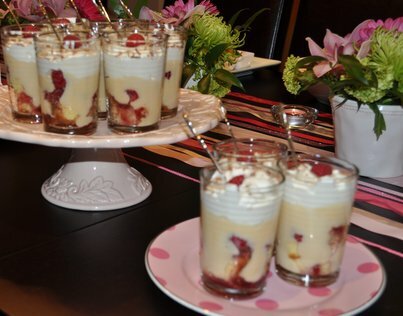 I haven’t made trifle before so would greatly appreciate your help. 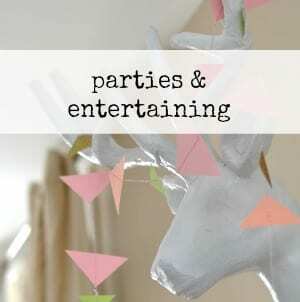 I’m in London ON – love your blog. Hi Catherine, I’m sure the day before would be fine, just wrap each one with plastic wrap and keep in the fridge. Good luck! Thank you for your help. I’ve been to Ikea and purchased the glasses and I’m all set. I will do it the day before. Keep up the great ideas.